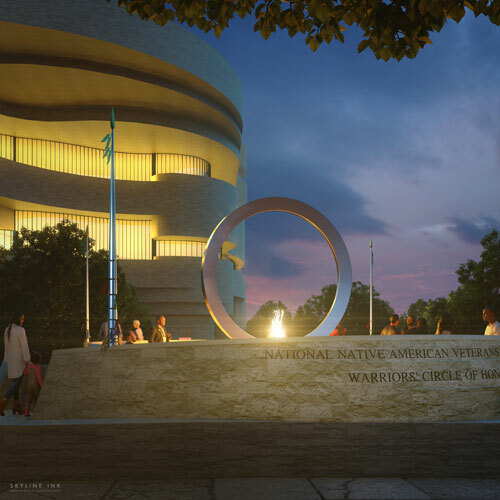 The jury for the Smithsonian’s National Museum of the American Indian, National Native American Veterans Memorial has unanimously selected the design concept submitted by Harvey Pratt (Cheyenne/Arapaho) titled, “Warriors’ Circle of Honor.” Groundbreaking for the memorial is slated for September 21, 2019. It is slated to open late 2020. Native Americans serve at a higher rate per capita than any other population group. Few outside the military and American Indian Nations know that Native people have served in the U.S. armed forces since the American Revolution and continue to serve today. The nation’s capital is known for its grand monuments and solemn memorials, including many honoring the nation’s veterans. Yet no national landmark in Washington, D.C., focuses on the contributions of American Indians, Alaska Natives and Native Hawaiians who have served in the military since colonial times. Pratt is a multimedia artist and recently retired forensic artist, as well as a Marine Corps Vietnam veteran. His design concept is a multisensory memorial. An elevated stainless steel circle rests on an intricately carved stone drum. Listen to Pratt describe his design concept in detail. The selected design will undergo further development in partnership with the museum. The museum worked with the National Congress of American Indians and other Native organizations to create an advisory committee composed of tribal leaders, Native veterans and their family members from across the country who assisted with outreach to Native American communities and veterans. The advisory committee and the museum conducted 35 community consultations across the nation to seek input and support for the memorial. These events resulted in a shared vision and set of design principles for the National Native American Veterans Memorial. Mark Kawika McKeague (Native Hawaiian), director of Cultural Planning, Group 70 International Inc.
More information on the competition regulations and process is available in the Design Competition Manual: https://nmai.us.fluidreview.com/res/p/regulations/. For more information about the memorial, visit AmericanIndian.si.edu/NNAVM. This project is made possible by the generous support of the Eastern Band of Cherokee Indians; Bank of America; Northrop Grumman; the Citizen Potawatomi Nation; the San Manuel Band of Mission Indians; Hobbs, Straus, Dean & Walker LLP; General Motors; Lee Ann and Marshall Hunt; the Shakopee Mdewakanton Sioux Community; and the Sullivan Insurance Agency of Oklahoma.